Lt Philip Clark and Crew 21 trained with the 458th in Tonopah and moved overseas with them in January 1944. 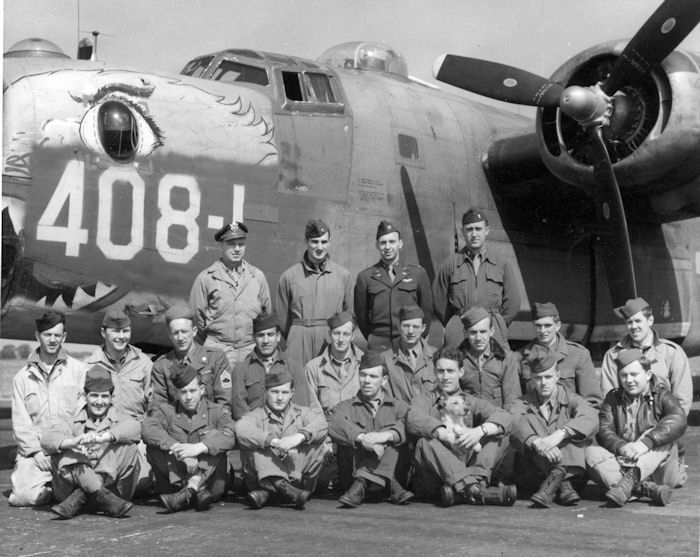 The ship they flew to England, B-24H-1-DT 41-28628, was sent to the 446th BG in February 1944. This crew was evidently chosen to be a lead crew very early on. They participated in both of the diversionary missions in late February in the 458th's support of "Big Week". 753rd Squadron Commander, Maj Frederick O'Neill flew with them on February 24th, and Group CO Col James Isbell went as the mission commander on the 25th. The crew flew on the group's first combat mission on March 2, 1944. Their command pilot on this date was Capt Jack Bogusch, 753rd Squadron Operations Officer, who would be killed on the first Berlin raid four days later. On March 8, 1944 Capt Charles Booth flew with Clark as deputy lead to Berlin. Somewhere near Hannover, Booth was hit in the legs by flak. Moved from the co-pilot's seat to the flight deck, he refused morphine, remained alert and in command of the mission. He was awarded the Distinguished Service Cross (DSC) for his actions on this date. The crew flew three additional missions in March, although they were forced to abort twice. On March 16th, according to notes by T/Sgt Walter Fifer, "Group bombed sea plane base & factory at Friedrickshafen, Germany. We were to fly deputy lead with Major O’Neill as CoPilot. While climbing through clouds ice formed on wings, etc. and we stalled out (a close call). We salvaged the bombs to lighten load, we landed, refueled, picked up more bombs but we couldn’t catch the group." On March 18th the crew were forced to turn back due to a gas leak and supercharger troubles. In April the crew participated in seven missions, aborting one time, again with mechanical issues; and, on the 21st being recalled about 20 minutes away from the target. Five of these missions were flown in lead spots with a command pilot aboard. 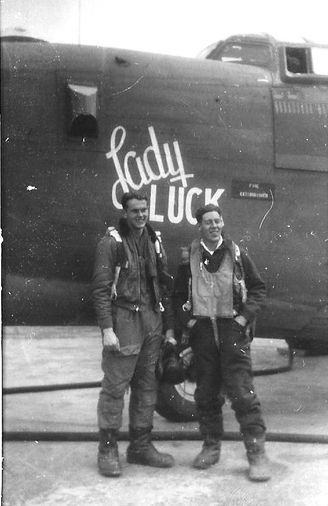 Four lead missions would follow in May, at which time the crew were chosen as a full time lead crew and were transferred to the 93rd Bomb Group at Hardwick. Navigator Lt Louis Haley had proceeded the rest of the crew in April. At this time in the 2nd Bombardment Division, lead crews were concentrated only in certain groups, the 93rd and 389th in particular. 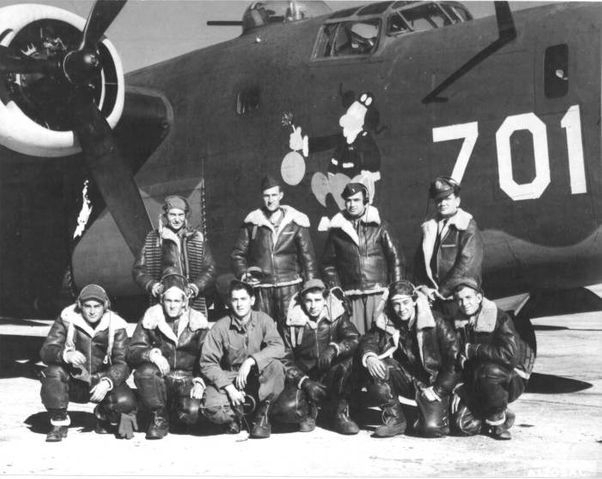 These crews would then be assigned to fly with other groups as lead planes, utilizing a command pilot from the "host" group. So in the month of June 1944, while assigned to the 93rd Bomb Group, Clark and crew were slated to fly lead for the 458th on three occasions. 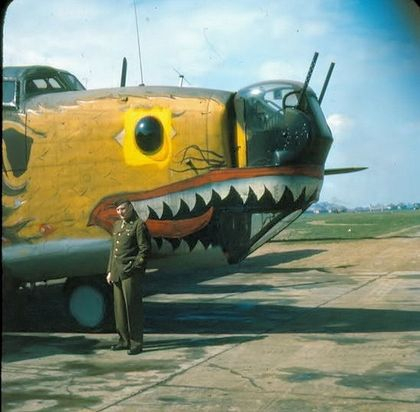 Capt John Ollum, Operations Officer in the 755th Squadron, flew as command pilot with them twice, while Capt Rodney Freeman, the 753rd Squadron Operations Officer, flew with them once. Crew 21 flew 15 credited sorties while with the 458th. 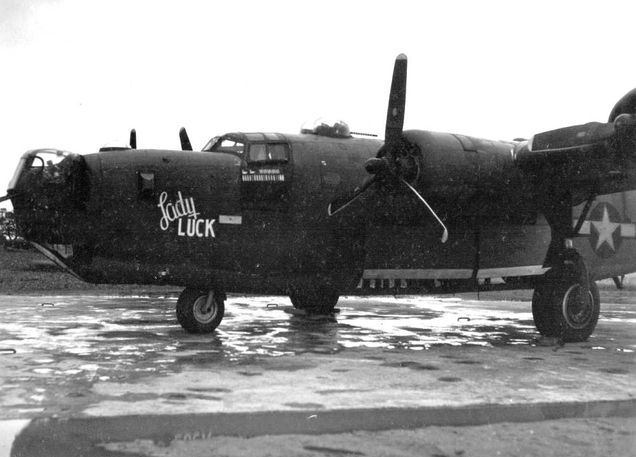 The aircraft they flew most and considered "their ship" was B-24J-100-CO 42-100408, and according to Walter Fifer was named Lady Luck. They flew this aircraft on 15 occasions and were sorry to leave it behind. All of the crew completed their combat tour with the 93rd Bomb Group in late July or early August and were rotated back to the States. T/Sgt Walter Fifer, the crew's radio operator, kept a very detailed diary of the crew's time in the ETO. 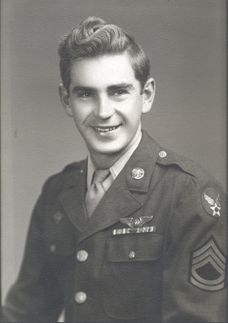 His son Scott has created an excellent website A Radioman's Log where the entire diary, photos, and a timeline of Walter's military service are on display. Below is the entry for the March 8th mission to Berlin. The aircraft that Crew 21 called their own, showing 18 mission symbols, 2 decoy symbols for the February diversion missions, and symbols representing five German fighters knocked down. One of those fighters belonged to flight engineer, T/Sgt Charles Innis, who was awarded a fighter "destroyed" on the April 8, 1944 mission to Brunswick. Ball Turret Gunner, S/Sgt Hugh Donovan was awarded a fighter "damaged" on the same date. 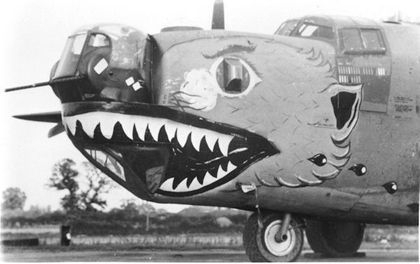 This Liberator possibly under went a dramatic change in nose art later on with the group and became known as The Beast. This Liberator had quite the career with the 458th. An original aircraft, it was flown on the group's first mission, February 24, 1944 - a diversionary feint to the Dutch Coast in support of "Big Week"; and on the group's 239th mission on April 20, 1945 to Zwiesel, Germany. This ship remained in the 753rd Squadron for its entire career, amassing a total of 54 credited sorties. A former group lead aircraft, it was relegated to a "wing" ship in June 1944. This ship also took part on six AZON missions flown by the 753rd Squadron in the summer of 1944. There are several gaps in the Liberator's mission dates that may explain the relatively low mission count. Between June 22 and July 20 no missions are recorded. There is evidence that an emergency landing took place at Horsham on June 23rd and is the reason for this. 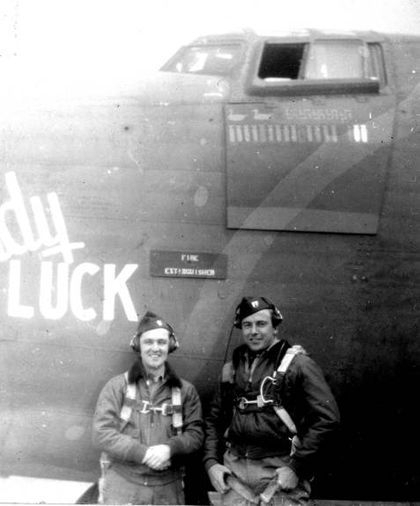 Former 458th radio operator Walter Fifer, who had been transferred to the 93BG in May, made the following entry in his daily journal: "June 23 & 24- Sack time. Our old ship Lady Luck was shot up & crash landed at our old base. Our squadron has been stood down for a few days to get the ships back in condition". Records for this particular incident are currently not available. The second, and much longer period between combat flights came in mid-October 1944, when the last recorded mission was on the 19th to Mainz, Germany. The next time #408 appears on records is January 29, 1945. The reason for this hiatus is unknown. Exactly when Lady Luck became The Beast (or, as some called it, Beastface), and the artwork changed is unknown. Perhaps during one of the long spells of apparent inactivity, someone decided to spice up the nose a bit.